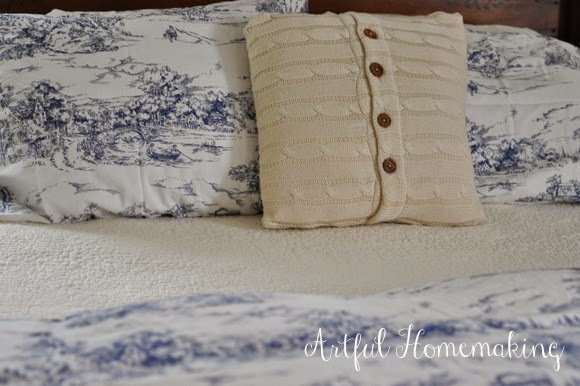 With the arrival of spring, I was feeling like a change in our master bedroom. I wanted something light and airy and peaceful. 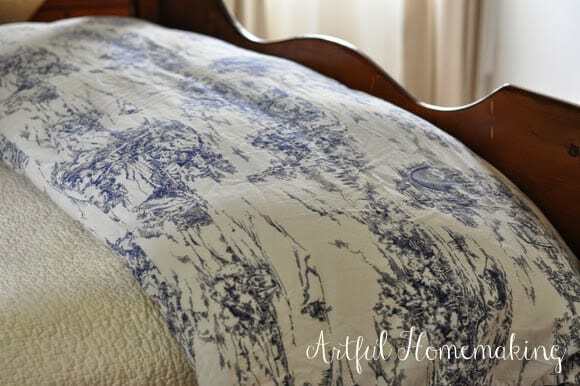 I came across this blue toile duvet cover and matching pillow cases. (Ikea brand, which I got inexpensively from Ebay a few years ago). I just flipped over my quilt so the pink roses on the other side wouldn’t clash with the blue. 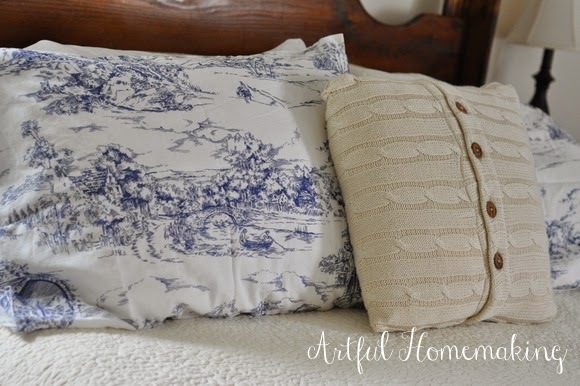 I love toile! 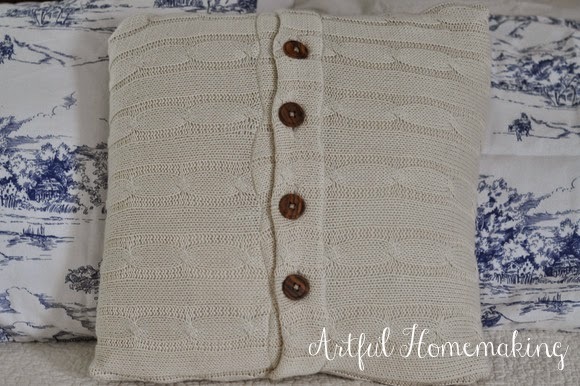 And I love the cream-colored pillow I got from Zulily for free with credits. 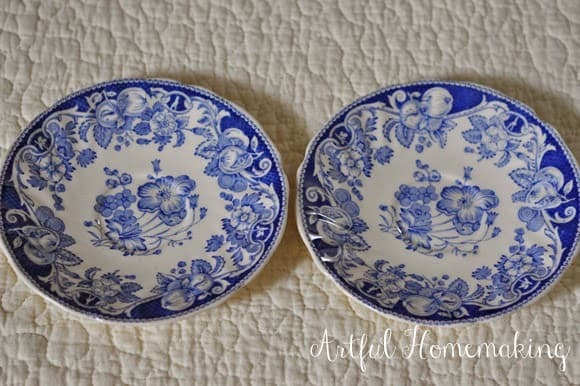 Then I used some accents that were already on hand, such as these blue transferware pieces purchased from local flea markets years ago. I think it’s a nice change for spring and summer, and it didn’t cost a thing! We just switched to a blue and yellow comforter which was given to us by acquaintances who were getting rid of stuff. The weather has turned so cold the past could of days though that we have had to add another blue blanket on top to stay warm! How nice to get a new-to-you comforter! I know what you mean about the cooler weather–we've had that here, too! It looks lovely! Blue is my favorite color! So lovely! 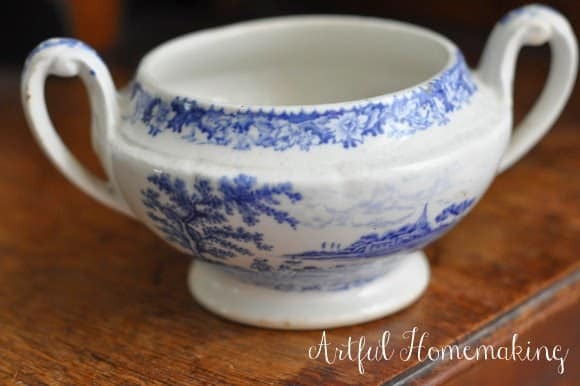 I love blue Willow as well and toile (in blue or red). 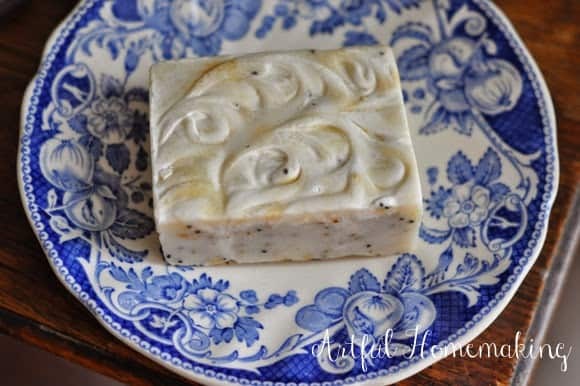 Love the soap – did you make that? Thank you! I'm the same way–I like the toile in blue or red. I also have a sewing machine cover I made in green toile. 🙂 I do make my own soap, but that bar was a gift from a friend. Blue is a good choise for the bedroom. A bedroom will become a peaceful and graceful space thanks a touch of blue, I think. Our bedroom is painted light pink … but there are some touches of blue ! I agree, Franca–blue is a great choice for bedrooms! Pink with touches of blue sounds very pretty! 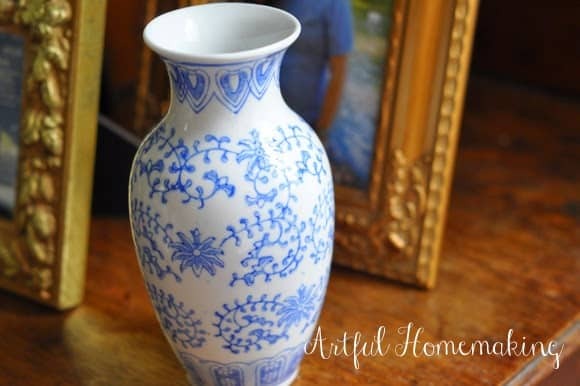 Love blue and white together, it looks great in the bedroom! 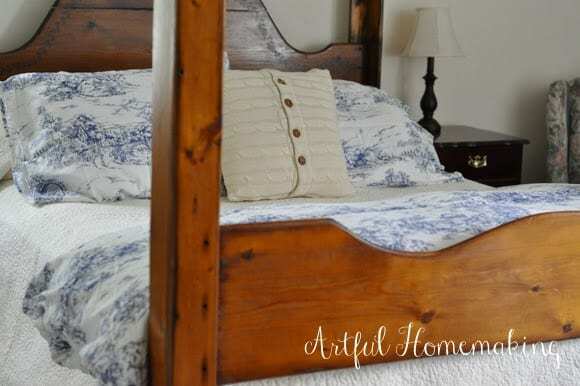 Your wooden bed frame is pretty as well, where did you get that from? Blue is such a tranquil color. Perfect for the bedroom – especially in summer when it is hot and sticky outside. Doesn't it feel even nicer to repurpose things you already have? Love that. I agree! And yes, I love repurposing!